Type: EQUIPMENT. Detail: TRAVELLING. Product Code: TCS3. It has a snapclosed plastic box with plastic hinges that opens up to a 345mm x 345mm board and 40mm black and white squares. 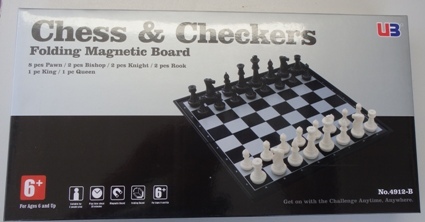 The pieces stay put with magnetic bases that keep them firmly planted on the board no matter where you travel. The King 68mm tall .